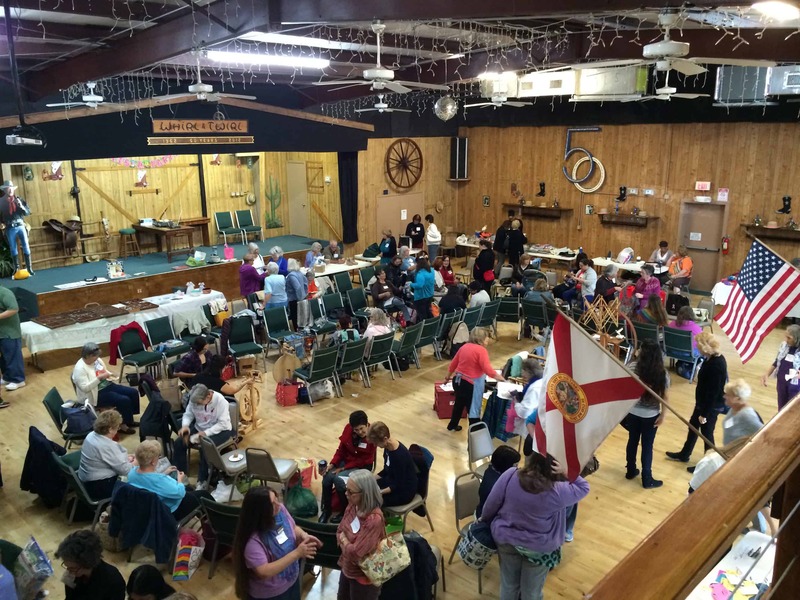 Saturday, January 10, was the Eleventh Annual Orlando Distaff Day. I’ve known about the event for the last 5 or 6 years, but have always had a conflict and been unable to attend. This year, not only did I attend, I also served on the planning committee. I had an absolutely wonderful time at this event! A “distaff” is the rod that holds unspun fibers while using a drop spindle. It facilitates the spinning process by keeping the fibers untangled for the spinner. The term can also be used to mean women in general. The phrase “Distaff Day” comes from an old world tradition of getting back to work after the celebrating the 12 days of Christmas. Women would resume regular household chores on that 13th day. Modern women have adopted this day to celebrate our many crafts and enjoy it together. For the last several years, Distaff Day was held on the campus of the University of Central Florida. 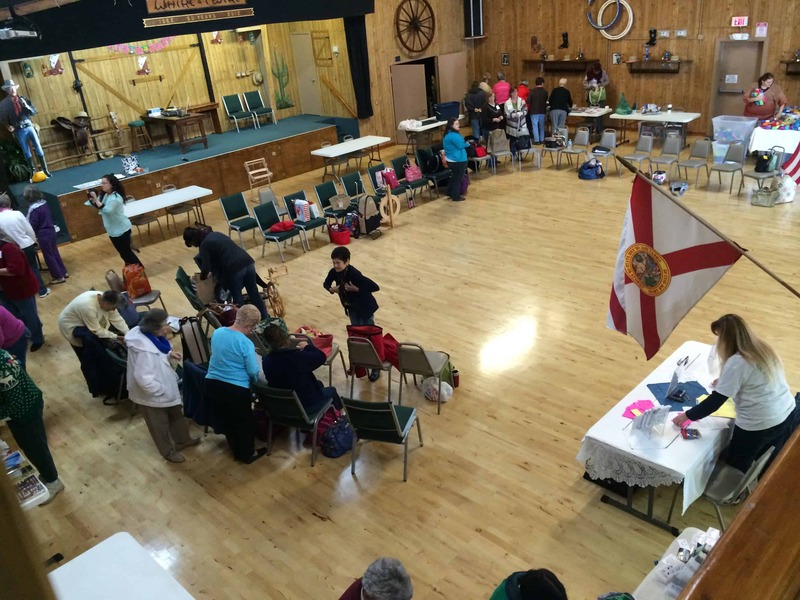 This year, the event moved off campus and into the Whirl and Twirl Square Dance Hall. At the new location, we were able to have food on the premises and no restrictions on vendors. However, people arrived in a steady stream early in the day. We quickly set up more chairs and they were occupied as soon as we set them up. We set up every single chair the venue had available. I didn’t see anyone looking in vain for a seat, but it was pretty close to standing room only! Project Warmies collects handmade blankets, hats, scarves, mittens, etc. and distributes them to homeless shelters, domestic violence shelters, and other charitable groups throughout the Orlando area. Last year, they came to Distaff Day for the first time and attendees donated 96 items. This year they came again. We don’t have an official count of donated items yet, but they definitely got more than 96! One of the first people in the door brought an entire black garbage bag full of items for donation. She’d gone back to school this year, she told me, and crocheting was keeping her sane. She was happy to pass these items on to someone in need. I was in charge of organizing demos. I had arranged for three demonstrators; two had emergencies (a family death and illness) in the two days prior to the event and had to cancel. Fortunately, two of the vendors pitched in at the last minute, so we still had three demos! The Weavers Guild of Orlando had a table with three members, each demonstrating a different handheld weaving technique: Nancy had her 10″ cricket rigid heddle with some dishcloth cotton, Gladys demonstrated Kumihimo weaving (unfortunately, I didn’t get a pic), and Gloria demonstrated a ribbon weaving technique. 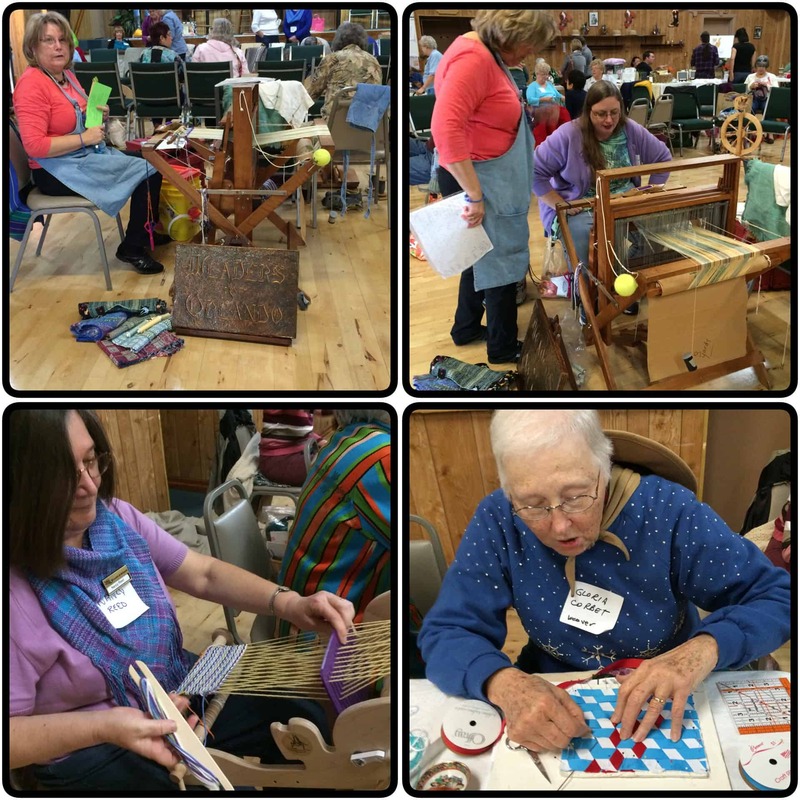 In addition, the Guild brought their 26″ Dorset floor loom. Bev showed attendees how to weave and let them try it out. Ann of Twin Mommy Creations (Etsy shop, blog, Ravelry) happily agreed to demo how to make a rolag when I asked her on Saturday morning. She makes it look so easy. There’s something about her casual style of chatting and patting down a bit of fiber here and another there that reminded me of Bob Ross from The Joy of Painting. It was fascinating to see the layers of fiber go down onto the blending board and then pulled back off as a rolag. Each rolag was a surprise to me. I tended to see only the top layer of the blending board, forgetting about the colors below. It was fascinating to see how the fibers and colors blended together into the finished rolag. 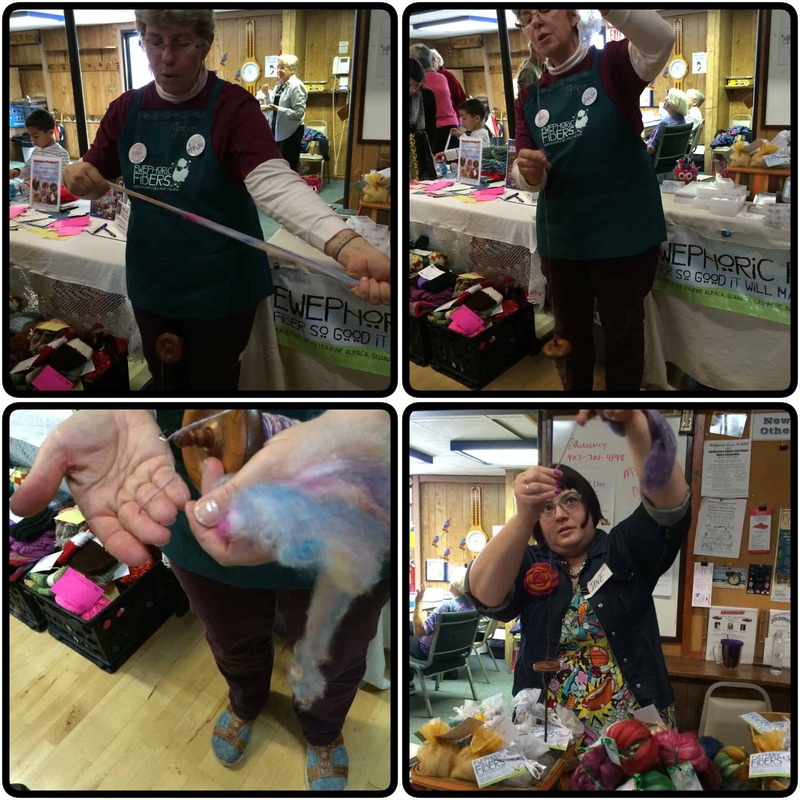 Ginger and Jane of Ewephoric Fibers (website, Ravelry, Facebook) quickly said, “No problem” when I asked them on Saturday morning if they could do a drop spindle demo. 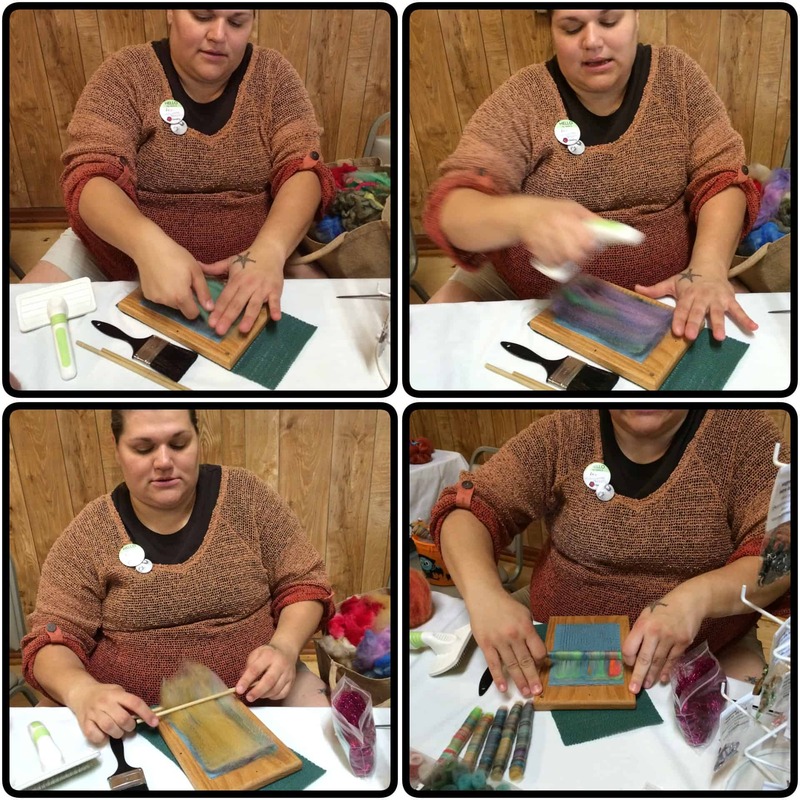 Ginger did most of the demo, spinning from a silk hankie and again making it look super easy. Jane spun a different fiber; I forgot to ask, but I think it was some of the merino / bamboo / nylon blend that they had in their booth. I’ve tried multiple times in the past to spin on a drop spindle and failed miserably. I knew nothing about spinning and I think drop spindle just required too many things at one time. Since I got my wheel last April, I have learned a little bit on how to draft and I’ve learned a lot about the theory of spinning. I wondered if spinning on the drop spindle would be easier for me now because of that. When the demo was over, Ginger let me try my hand at spinning. Silk isn’t the easiest fiber to spin and I wasn’t great at it, but I did much better than I ever have on a drop spindle. I think I need to break out my drop spindle (purchased from Ewephoric Fibers at the 2013 Florida Fiber In) and practice. 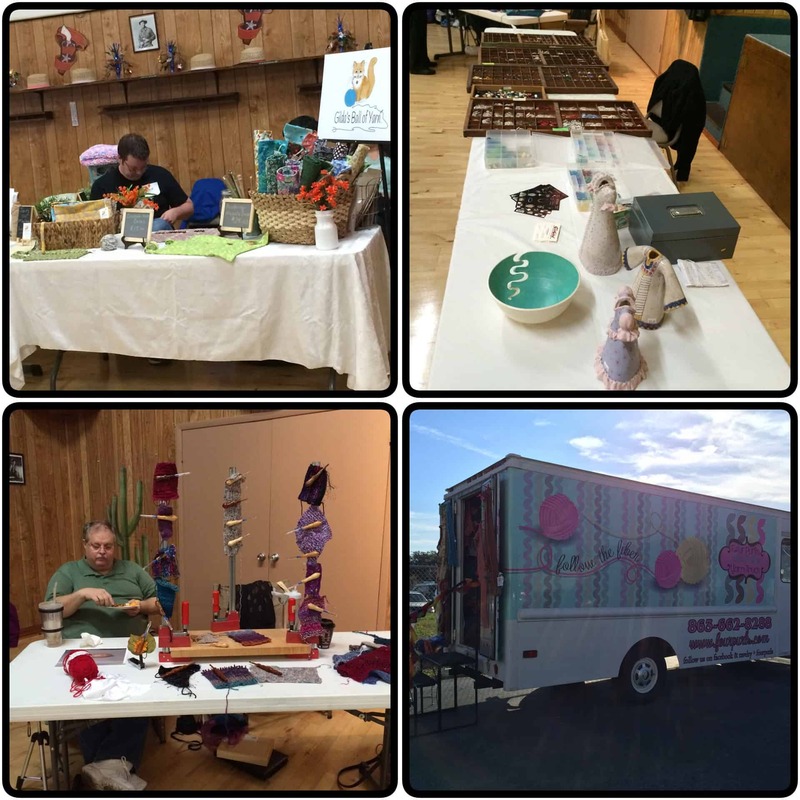 We had several other vendors at Distaff Days in addition to Twin Mommy Creations and Ewephoric Fibers. 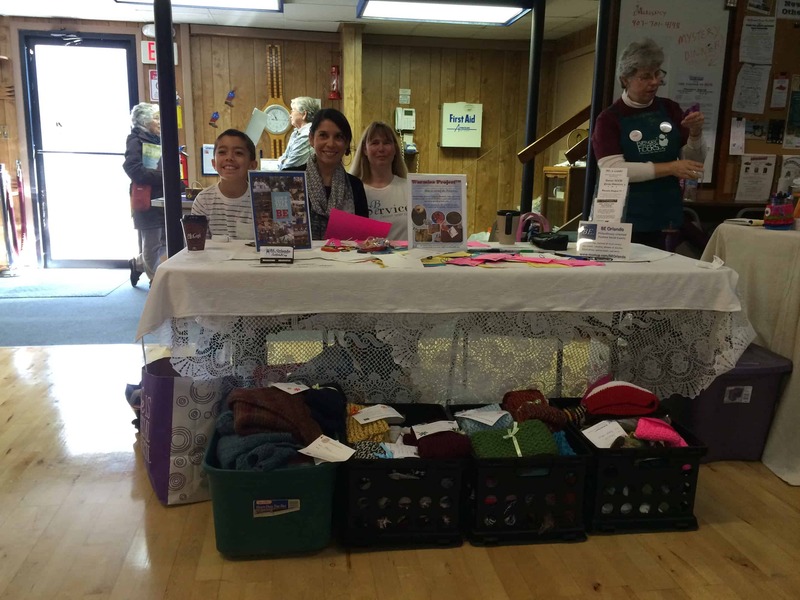 Gilda’s Ball of Yarn sold beautiful fabric needle cases; Ann Robinson, a potter for nearly 50 years, brought vases and yarn bowls and handmade buttons; a local woodcrafter had hand-turned crochet hooks, and Four Purls (website, Ravelry) brought their yarn truck. Every time I see the yarn truck, it makes me happy that such a thing exists! With so many fine vendors at the event, I knew I would be coming home with some new lovelies! First, I was excited to find that Four Purls had Knit Kits in the truck. I had a Knit Kit and I accidentally left it at my sister’s when I helped her move last summer. With all the commotion of moving, it has not been found. 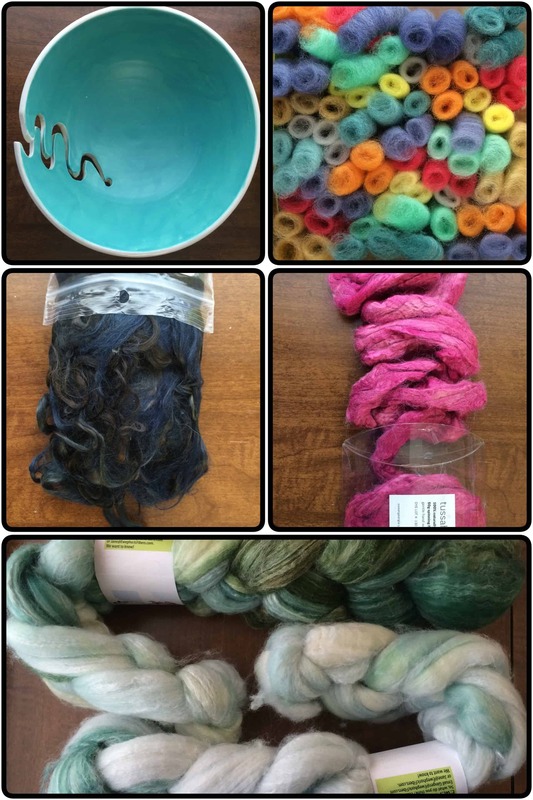 If you have never seen or owned a Knit Kit you are missing out. Tucked into the sides of the device you have a crochet hook, tape measure, yarn cutter, and row counter. 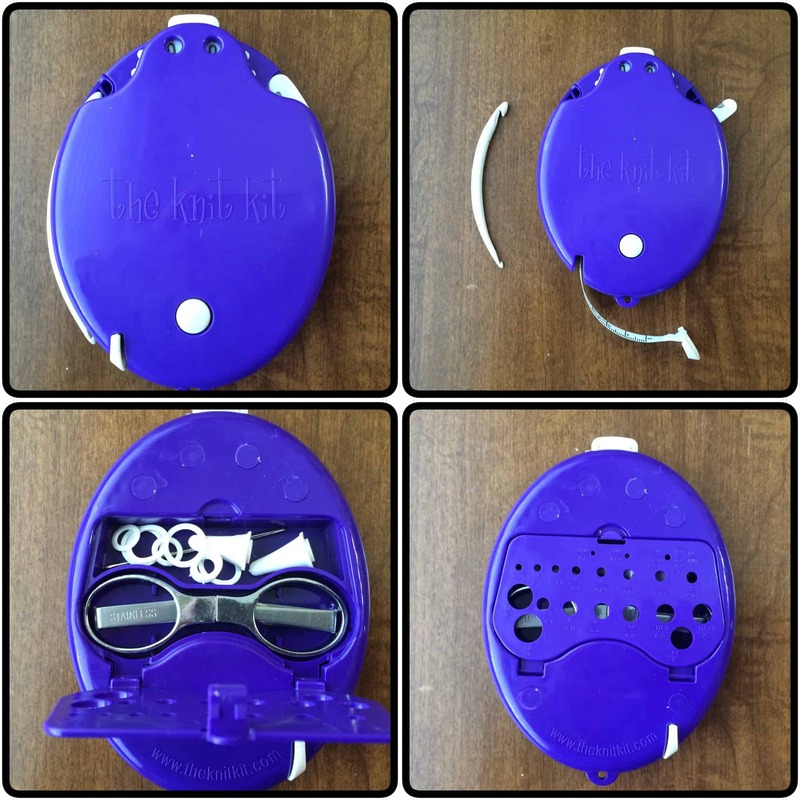 A compartment in the back comes equipped with folding scissors (which the package says are TSA compliant), needle point protectors, a tapestry needle, and stitch markers in a variety of sizes. There’s enough room left in the compartment for you to tuck in a couple small items of your own. I usually toss in a few metal jump rings (I prefer these as stitch markers), a couple lobster claw clasps (I use these as row markers), and a few large safety pins (I use these as stitch holders). The door to the compartment has a needle gauge built into it. This is a new feature that was not a part of the Knit Kit I lost! I also bought a yarn bowl from Ann Robinson. I’ve never had a yarn bowl before. I usually use an aluminum mixing bowl from my kitchen. I loved the colors of this yarn bowl and its size. It is bigger than most of the yarn bowls I’ve seen before. I bought a 3.4 ounce box of rolags from Twin Mommy Creations. They are superwash BFL and will be part of the Breed Specific Spinning project. I already had BFL, but thought it would be interesting to compare superwash BFL with non-superwash. From Four Purls I bought Suri Alpaca locks (sold by Four Purls, but dyed by Twin Mommy Creations) and Tussah Silk. Both of these will be part of the Breed Specific Spinning project. I already had some alpaca, but it is in roving. I have silk hankies and cocoons. I don’t think I had any silk fiber. I didn’t itemize out the silk when I made the inventory, so I’ll have to double check. Finally, I bought two braids of merino / bamboo / nylon from Ewephoric Fibers. I saw the pale braid first. I walked by the booth three or four times, and every time that braid jumped out at me. I decided it needed to come home with me. They only had one braid in that colorway, but I found the other braid, a gradient that starts with the pale color and then gets darker. I think I’m going to spin both braids from one end to the other so they look like one long gradient. I got to the event at 9:00 am, but didn’t sit down to craft until almost 1:00 pm. The first hour was set up time. After that, I was chatting and attending demos. I spent some time spinning the NGY Lux Top that I’ve been spinning since July (I finally finished spinning it on Saturday night after I got home. It still needs to be plied). I also started on warping my rigid heddle loom. I got the first step done — warping the slots — but I started too late to finish warping while I was at the event. I still need to sley the reed and tie on. We also had a gift exchange, door prizes, and Show & Tell. There’s one gift that comes back to the exchange every year — a crocheted bikini. Since this is my first time at Distaff Day, I don’t know when that started, but it is definitely a tradition now. Whoever gets it must bring it back. The door prizes were donated by our vendors. Apparently, I was everybody’s good luck charm. The people seated to my left, right, and behind me all won door prizes. And then the person next to the person on my left won one! I forgot to pick up a ticket for the door prizes, so wasn’t in the running. I should have bought a lottery ticket on my way home, but I didn’t. I love the Show & Tell portion of any event. I am always impressed and inspired by the talented crafters in the world. I had a wonderful time at Distaff Day. It was a relaxing day. I got to catch up with people I know and meet a few new people. I got to learn a bit, craft a bit, and bring home pretty new treasures. I am looking forward to next year. Maybe I will see you there!